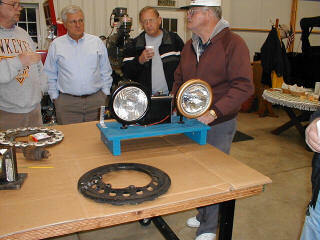 The August meeting was held at Jack Putnam's garage near Bluffton. Bob Torbet led the meeting with 13 members in attendance and 1 guest. Bob Hollister has set our club up as a non-profit corporation. 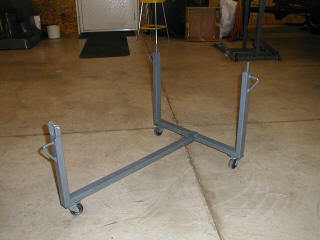 This does not exempt us from sales tax; but, it does protect the club members from law suits aimed at the club. Jack Putnam's residence has been established as the address of the corporation. The September meeting was canceled because most of the members of the club were all T'd out after the Jamboree. 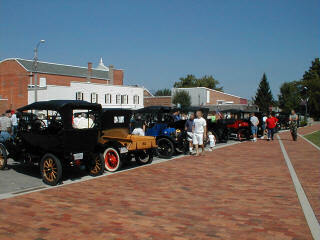 Speaking of the Jamboree, this year's 14th Annual Ohio Model T Jamboree was a great success. We have received letters from participants about how much they enjoyed the agenda and the banquet. There have even been thanks on the International Forum about the fun. 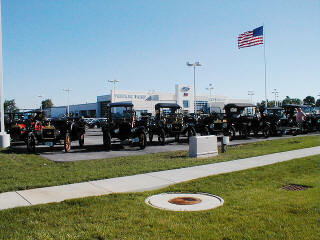 Stan at Findlay Ford was thrilled by the number of Model T's in his lot. 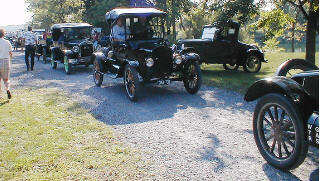 The Sunday night banquet was better than previously expected and featured a presentation of Model T's down under. Tilton Farm and New Bremen were the real surprises of the tour. The farm had more "stuff" than anyone expected. And, New Bremen had a reception set up that no one expected. 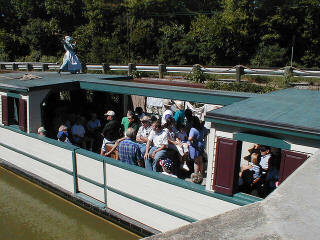 While in Grand Rapids, the group rode on a canal boat from the old canal system that crossed the state from north to south. 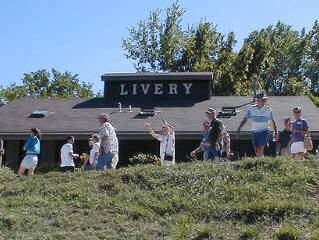 Of all of the places that we visited on this tour, Tilton Farms received the most comments from the participants. They were amazed at the amount of collectibles in this private collection. Does anyone have any pictures? I was too busy looking to get any other good pictures. 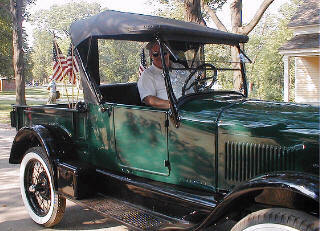 The New Bremen Chamber of Commerce had publicized our arrival so much that people lined the streets (and country roads) to see the 90+ Model T's come into Town. 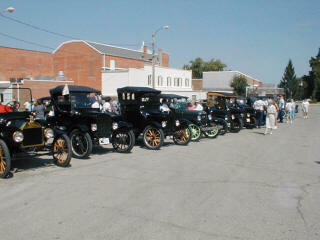 Once in town, the entire caravan of Model T's was ushered into the main parking lot and we had an instant Car Show. 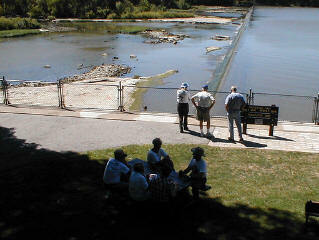 We had people from all over the area checking us out. While the locals were enjoying our cars, we were enjoying the Grille Restaurant. The main attraction in New Bremen (other than our car show) was the Bicycle Museum. 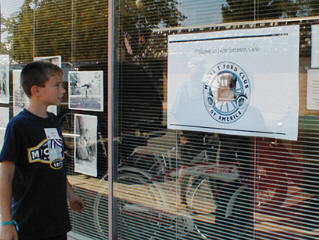 This museum has more bicycle history than Henry Ford Museum or the Smithsonian. The staff was very helpful and friendly. I'd like to take this occasion to thank everyone who helped to make this year's Jamboree a success. The many members who helped to make this event seem as effortless as it did are to be commended. The effort helps other clubs realize that they could do this too!!! 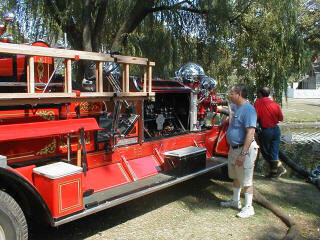 There are a lot of old vehicles at the Old Car Festival; and, among them are old fire trucks. I'm sure that some of our club members could identify this truck in a second. Those fire guys just love to show off how much pressure those old trucks can muster. The small truck was pumping earlier. Jack Putnam won 2nd in his category. The judges were really impressed. A big sorry to Jack of putting his face in the middle of the windshield support. I took tree or four pictures and this was the best of the set. For those of you that were at the Jamboree, you will be interested to know that the champion of the Old Car Festival this year was Vern Campbell. His Maxwell won Best of Show. 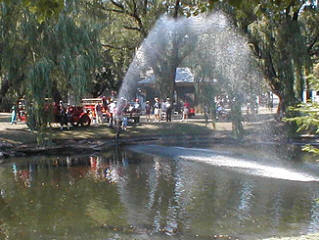 The Greenfield Village Old Car Festival is the oldest continually running car show in the country. Cars are entered by invitation only. 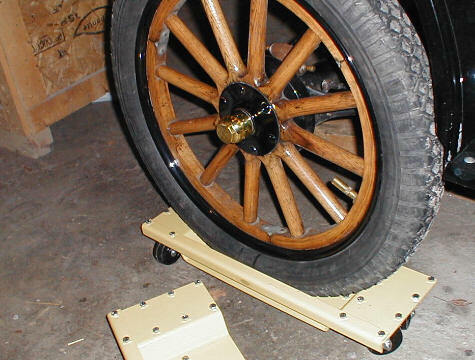 The aim is to represent every make and model of car before 1931. 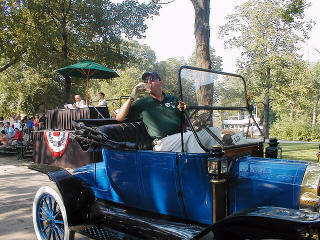 The cars are paraded through the streets of Greenfield Village and also reviewed one at a time past a reviewing stand. It isn't your everyday (sit next to the car) car show. We were encouraged to drive around the village to show off the cars. Also, the club soda supply has hit an all time low. Please bring a six pack of your favorite soda to the next meeting so that we can continue to partake.